Human activity recognition (HAR) in ubiquitous computing is beginning to adopt deep learning to substitute for well-established analysis techniques that rely on hand-crafted feature extraction and classification techniques. From these isolated applications of custom deep architectures it is, however, difficult to gain an overview of their suitability for problems ranging from the recognition of manipulative gestures to the segmentation and identification of physical activities like running or ascending stairs. In this paper we rigorously explore deep, convolutional, and recurrent approaches across three representative datasets that contain movement data captured with wearable sensors. 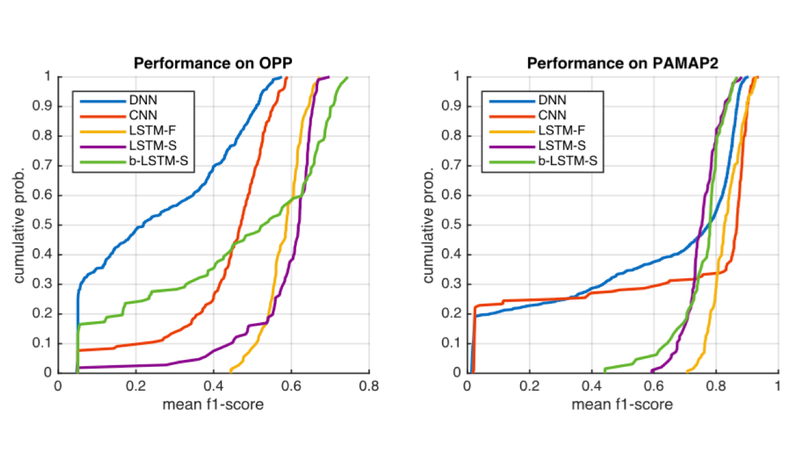 We describe how to train recurrent approaches in this setting, introduce a novel regularisation approach, and illustrate how they outperform the state-of-the-art on a large benchmark dataset. Across thousands of recognition experiments with randomly sampled model configurations we investigate the suitability of each model for different tasks in HAR, explore the impact of hyperparameters using the fANOVA framework, and provide guidelines for the practitioner who wants to apply deep learning in their problem setting.